For a one-man band, Kevin Dinsmoor has had remarkable success. 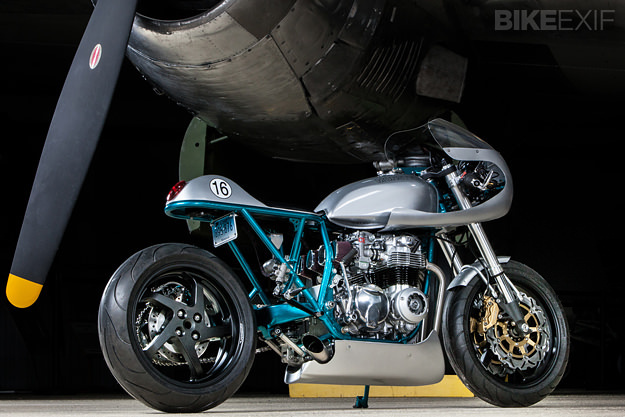 Based in the small town of Colchester in Connecticut, USA, he’s carved out a reputation as a builder of finely crafted vintage customs—like this Honda CB550F. 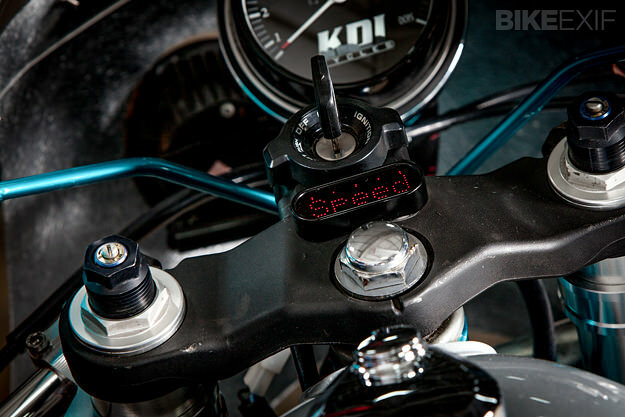 “The concept was hatched a couple of years ago,” says Dinsmoor, who runs KDI Cycles. “I wanted to prove to myself that I could build a bike from swap meet junk.” With $450 in his pocket, Dinsmoor bought a tired 1975 Honda CB550F, a swing arm, two wheels and a tank—all from different vendors. Despite the budget nature of the build, Dinsmoor decided to avoid the retro café route. 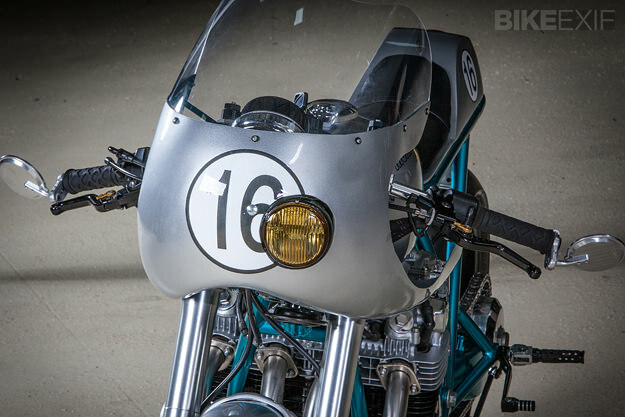 (“I have so many old café racers that go way too fast for the tires and brakes—and I like to ride fast!”) Instead, he decided to take the resto-mod approach. Work started on the engine. It now has a crankshaft lightened by six pounds and balanced by APE, allowing the revs to spin up much faster. Dynoman big bore pistons bump capacity up to 605cc. Dinsmoor also swapped out the stock CB550F cylinder head for a Mike Rieck special—complete with 1 mm oversize valves, titanium retainers, and heavy duty springs. A Web Cam #358B ‘hot street’ cam was dropped in, and a Keihin CR29 carburetor bolted on. Gases now exit via a custom Yoshimura-style exhaust. 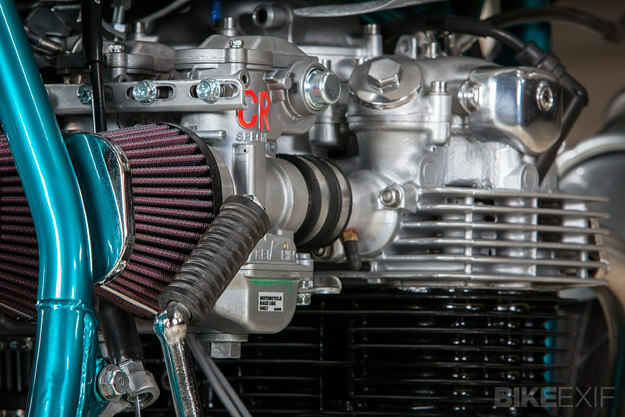 Other uprated parts include a Pamco high performance electronic ignition, a Motogadget speedo, a Barnett clutch and a custom-made transmission output shaft. The starter motor has gone, saving a few more pounds, with the space now taken by a crankcase breather. The stock Honda CB550F suspension has been replaced by newer components better able to handle the extra power. The front end is now from a 2003 Honda CBR900RR, and the swing arm from the swap meet, a 1995 VFR, has been modified by Pro Kart.) The rear suspension, steering damper and brakes are all from a Suzuki GSX-R750. The wheels are Marchesini, now shod with Michelin Pilot Power sportbike tires. 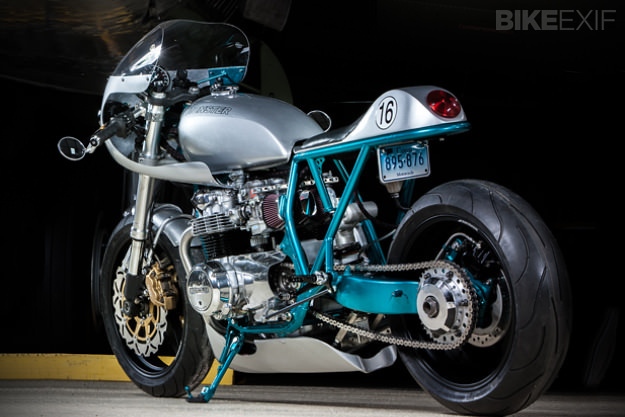 Dinsmoor has excelled at the bodywork, with a keen eye for matching parts or creating his own. 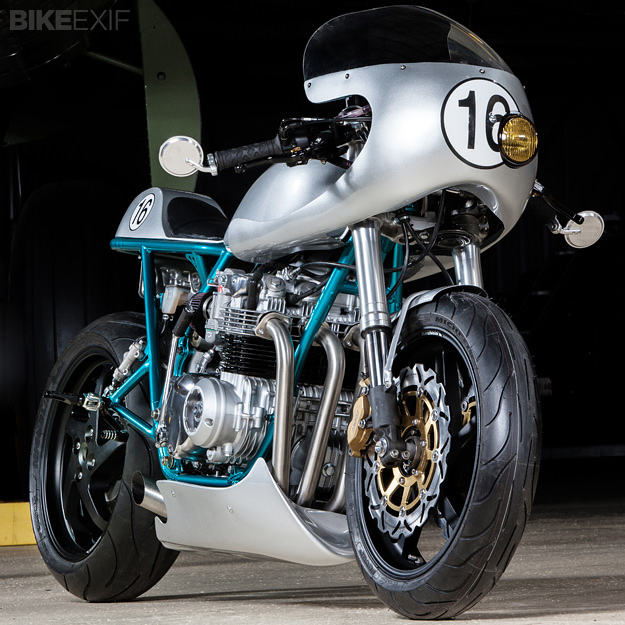 The tank is from a 1976 Kawasaki KZ400, but the seat unit is hand-made from aluminum. The fairing comes from Glass From The Past, and sports a Honda Accord fog light. The powdercoating was handled by Competitive Edge Coatings, and the paint by K&W Custom Auto. They’ve both done a magnificent job. For more on this lovely CB550F, head over to this build thread on the Do The Ton forum. And follow KDI Cycles’ news via Facebook. Images courtesy of Ron Agnello, © Strongbox Photography Studios LLC. Shot at the New England Air Museum.